Instant Pot scalloped potatoes has become our favorite go-to, family gathering side dish to make! 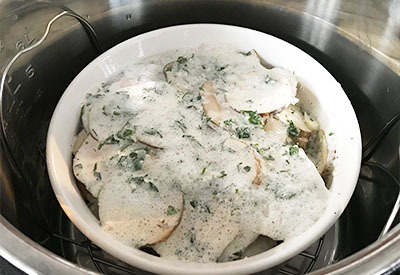 I would have never imagined that I would be making scalloped potatoes in the Instant Pot. I have always made them in the oven and they were perfect. 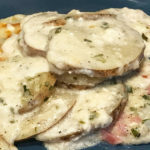 Creamy and Cheesy Instant Pot Scalloped Potatoes with ham. However, one day when I was making a large meal for our extended family, I ran out of oven space. I had a large ham taking up the space on the top rack, and a large baking sheet of roasted vegetables on the bottom rack. I didn’t have enough room in the oven for the potatoes. And I knew that I wouldn’t have enough time to bake the scalloped potatoes after the others were cooked. 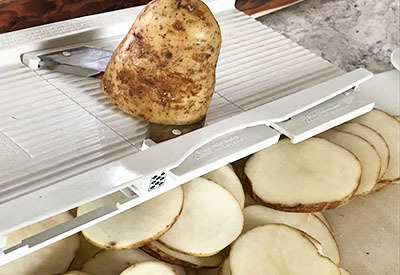 Make life easier by using a mandolin slicer to cut your potatoes in thin, even slices. 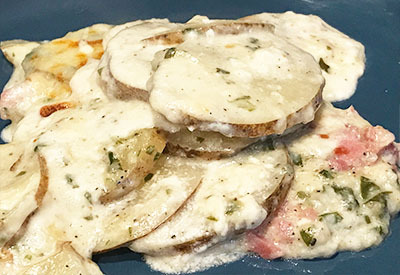 So I pulled out my trusty Instant Pot and our Instant Pot Scalloped Potatoes recipe was born! I have never followed a true recipe when making Scalloped Potatoes. I have just used the basic concept of milk, cheese, spices and potatoes. However, there have been a few good surprise ingredients that make this recipe so tasty! Scalloped potatoes in a 1 1/2 quart corningware dish placed on the trivet in the Instant Pot. I use both heavy cream and milk. The cream adds not only a little thickness to the sauce, but also another depth of flavor that you wouldn’t get if you only used milk. When adding garlic I prefer to grate mine with a microplaner, as it blends better with the sauce mixture. Don’t be afraid of using cayenne pepper. It adds a little flavor without a hint of heat. And the absolute biggest surprise ingredient – cilantro! I actually came across using cilantro in my recipe by accident. When I would make scalloped potatoes in the past, I always grabbed a small handful of parsley and threw it in. After the potatoes are cooked, add the cheese and place it under your broiler for best results. When I went to the grocery to gather the ingredients, I mistakenly bought cilantro instead. So I decided that I would give it a try! It was amazing! Now I use it in my recipes all the time! And one last hint – if you prefer, you can peel your potatoes. If i have enough time I do, but sometimes I am in such a hurry, that I keep the peels on. Either way, they taste great! 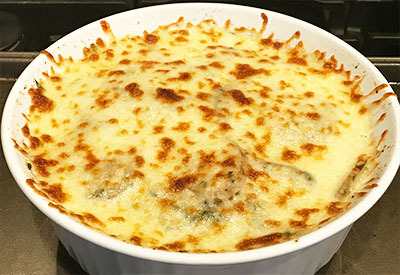 Cheesy scalloped potatoes made using the pot-in-pot method in the Instant Pot. Thinly slice the potatoes using a sharp knife or a mandolin slicer, set aside. In a medium bowl add milk, heavy cream, garlic flour, salt, black pepper, cayenne pepper and cilantro. Whisk well. Using non-stick cooking spray an oven safe pan that can fit inside your pressure cooker without touching the sides. Place half of the potatoes and half of the diced ham in the round pan. Top with ½ cup of mozzarella cheese and ½ cup of cheddar cheese. Pour half of the liquid over the top of the cheese. Repeat the layer by adding the rest of the potatoes, ham and liquid, but not the cheese. Pour 1 1/2 cups of water into the liner of the Instant Pot and place the pan on top of your trivet. Carefully lower the trivet and pan down into the pot. Close the lid and move the valve to the sealing position. Pressure cook/manual on high pressure for 28 minutes. Once cooking time expires complete a quick release of pressure. Add remaining cheese, close the lid and let cheese melt for 5 minutes. Carefully lift the trivet and pan out and place on a baking sheet. Top with the remaining cheese and place under the broiler in your oven for 3 minutes until the cheese begins to brown. Let potatoes sit for 5 minutes to set before eating. Can this be made without an extra pot….and just leave it in the instant pot container that comes with it. We have the 8 quart, but I do not think we have anything that would fit into it. Yes it can, I would just be sure to spay the pot with non-stick spray. The seasonings are added in step 2 with the milk and the cream. Hope that helps!